To make quinoa, combine quinoa with vegetable broth and rosemary in a small saucepan. Bring to a boil, reduce to a simmer, cover, and let cook for 10 minutes. After 10 minutes, remove quinoa from heat and let sit, still covered, for another 5 to 10 minutes or until water is fully absorbed. While quinoa is cooking, preheat oven to 375 degrees. Remove the stems and lightly rub with 1 tablespoon olive oil. Place cap side up on a baking tray covered with parchment paper and sprinkle with 1/3 teaspoon sea salt. Roast mushrooms for 5 minutes. Remove from oven and flip over. Place white beans in a medium bowl and mash with a fork until beans are in small pieces. Add garlic, lemon juice, ¼ teaspoon sea salt, and black pepper; stirring until combined. Cut spinach into small strips and add to bean mixture. Stir until everything is well combined. Divide quinoa mixture among the mushrooms caps. 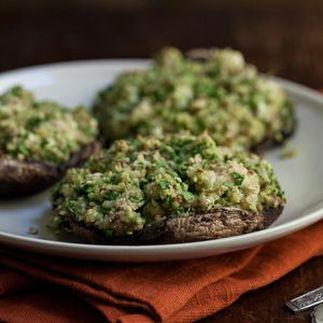 Return the mushrooms to the oven and bake for 15 minutes until filling is lightly brown. Serve immediately.